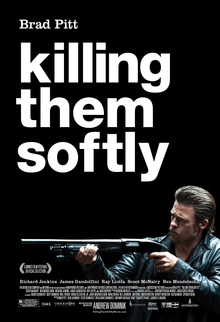 Although I'm late to write about it, I saw the new movie Killing Them Softly over the weekend. I hadn't even heard of the movie until a few hours before going to the movie theater. I simply checked local movie listings to see what was playing and when. I was actually hoping to see something different, but when I saw the movie's trailer, I was intrigued. I figured it was one of those dark comedies, like a Quentin Tarantino movie, and it had a strong cast, so I figured I couldn't go wrong. Well, the movie is certainly dark, and there are comedic moments in passing, but it is a far cry from anything as good as Quentin Tarantino would create. Nearly a week later, my brain is still chewing on it a bit. There is a lot to take in, and the movie is incredibly violent, which clouds the underlying thought process with the stress of having watching something so intense, but I think I've reached the point where I can discuss it somewhat intelligently now. Ostensibly, Killing Them Softly tells the story of two desperate, small-time criminals in such dire straights that they are willing to take on virtually any "job" (meaning criminal activity) in order to make ends meet. Another corrupt local business owner hatches the idea of robbing a weekly poker game run by the mob. So he pays the two small-timers to rob the game. The rest of the movie depicts the mob's coordinated efforts to patch things up. And the mob has their work cut out for them. They contract Brad Pitt's character, a hitman, to clean things up, but discover that his ideas of how to do it are a lot messier than they anticipated. The hitman first declares that the poker game's primary organizer has to be killed despite his innocense to spread a zero-tolerance message to the criminal community. Next he brings in additional hitmen of various levels of offensiveness to deal with various aspects of the killing that needs to occur. Early on in the film, it becomes obvious that we are not simply watching another heist movie, but a symbolic account of the 2006-2012+ financial crisis, and the business and political environment that either contributed to it, or acted to correct it, or both. Throughout the movie, the audience is told that, "in America, you're on your own," and Pitt's character declares in the film's climax that "America isn't a country, it's a business." So pessimism about the filmmakers' perception of the American system runs deep. But the particulars of the film's symbolism are not particularly easy to identify, and one has the impression that it could go many different ways, depending on one's opinion of the financial crisis and what caused it. For example, it's not clear to me whether the poker game in the movie represents the financial industry specifically or American commerce in general. When I watched the movie, I was largel convinced that it was the former, but having spent more time thinking about it - and considering the depressing pessimism expressed throughout the film - I am now more inclined to believe that the gambling represents commerce. The filmmakers seem to believe that business is a racket. In fact, every character in the film is a criminal of some kind. Those who aren't thieves and killers are running things from behind the scenes. The wealthy mafiosos - both the ones on-screen and those we never see, who are merely alluded to - clearly represent the political system. But Pitt's character, hired to clean things up while dispensing truth-bombs about the real America, could be seen as either the President of the United States or some behind-the-scenes group of CEOs. It's not exactly clear. And this, at the end of the day, is the film's Achilles Heel. I could work my way beyond the movie's violence and dreariness. I could tolerate any hackneyed political message the filmmakers could throw at me, even ones with which I disagree. I could tolerate the many implausible situations and the many repulsive characters. But if I tolerate all of that and discover, at the end of it all, that the thrust of the movie doesn't seem to be much more than a dark misanthropy applied to the various players in the American system, then I could have just stayed home and perused the various corners of the social networks to which I subscribe. So, despite an uncharacteristically strong performance from Brad Pitt, I have to say that Killing Them Softly is unfortunately not worth the price of admission. It's too dark, too depressing, too violent, and above all, too vague. If you're not already depressed about the world going into it, the movie has nothing more to offer you than the filmmakers' own pessimism. Pass this one up, folks.